REVIEW: In the early 90's, Double Dragon was pretty much a household name, thanks to the success of the original Double Dragon arcade beat-em-up, in addition to the flop of the horrible 1994 Double Dragon film. 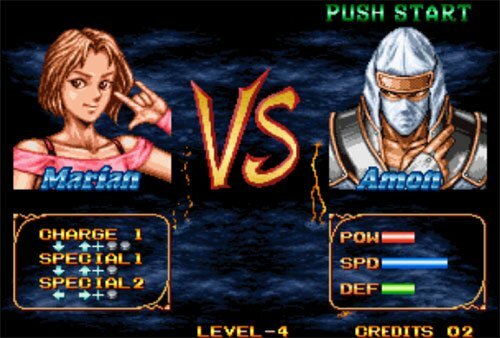 The 1995 Neo Geo fighting game is actually a spin-off of the movie, but also takes some cues from the beat-up-em series. Double Dragon features 10 selectable characters and 2 bosses. At first glance, Double Dragon seems like yet like another "me too" Street Fighter 2 wannabe of the mid-90's... and for the most part, it is. Instead of featuring specific kick & punch buttons like most fighting games, characters in Double Dragon have 4 basic attacks which wary depending on the character's position. 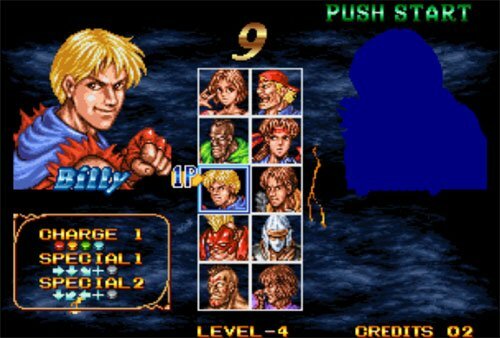 A super move meter is also present (known as a "charge" meter in this game), and fills up faster when a character has less health. Special "charge moves" are performed by executing the command of a regular special move and pressing two attack buttons simultaneously at the end instead of just one. 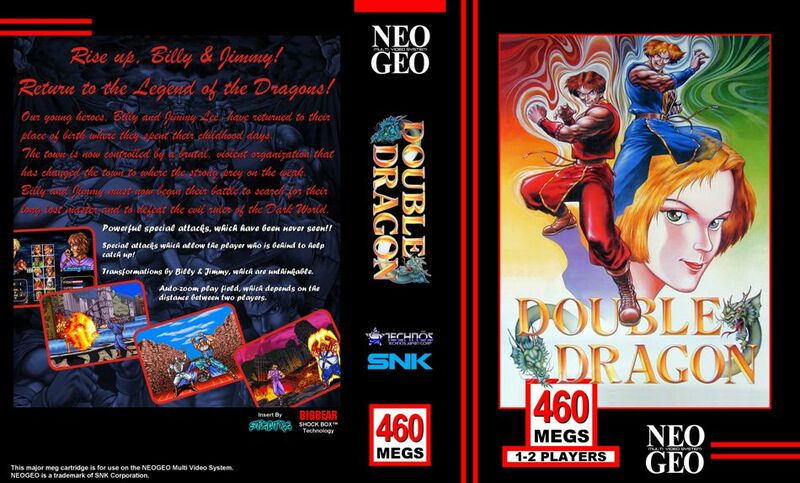 Double Dragon is a very straight-forward 2D fighting game, offering halfway decent gameplay... but really not much we haven't seen before in other fighting games of the era. To its credit, the game does have a few entertaining characters with interesting abilities, like characters that can change costumes mid fight (Billy & Jimmy). However, a lot of the designs are typical "90's fare"... shallow and generic, with horribly translated in-game dialogue. If you could somehow get past all that, some of the characters do feature halfway interesting fighting styles, making the game "playable" at the least. Billy & Jimmy doing what they do best. Visually, this incarnation of Double Dragon didn't appeal to me like other fighting games did in the mid 90's. After becoming accustomed to the smoothness of other 2D fighters, it's difficult for me to go "backwards" in terms of animation and gameplay. Come on, this game was competing with the likes of Marvel Super Heroes, MK3, KI2, Samurai Shodown 3, Darkstalkers 2... the list goes on. At best, Double Dragon is bright & colorful, and the character sprites are considerably large for the time period (but perhaps a bit too 'flat' for their own good). The PlayStation port has some differences from the original version. There were a few visual changes to backgrounds and characters, and the PS1 version adds 2 new modes, Overdrive (slightly faster gameplay) and Tiny 3D Mode (a shoddy attempt at making the game appear 3D). Compared to other PS1 fighting games in 1996, Double Dragon was definitely "behind the curve" in a few areas. Final Words: Double Dragon "the fighting game" was a decent spin-off of the classic beat-em-up, but really just an average 90's fighting game. As a fan of many Capcom & SNK games in the early 90's, Double Dragon failed to spark my interest. I gave it a try, and still wasn't all that impressed.